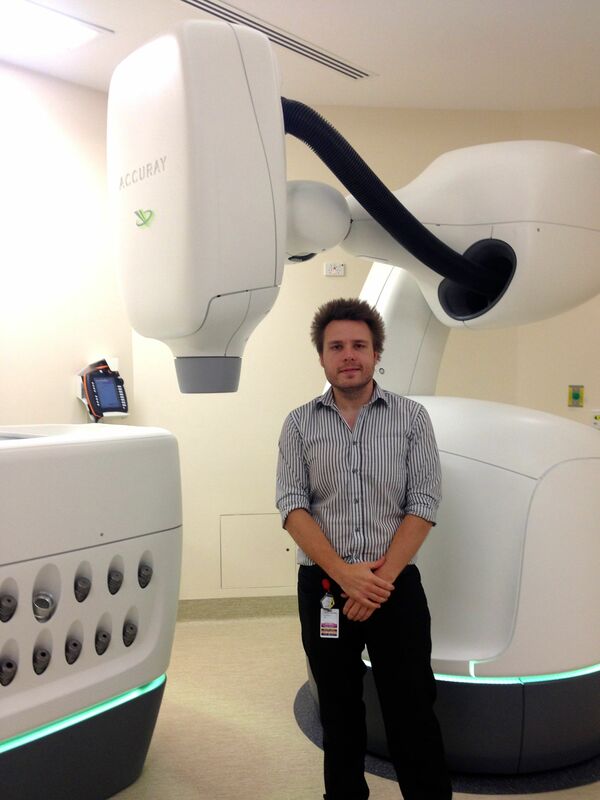 New to Perth, CyberKnife was first used here in April to treat patients. The radiotherapy treatment process requires a team of medical physicists, radiation therapists and doctors. First the patient receives MRI or CT scans, on which the doctor outlines the target volume of the tumour. For the particular case the doctor decides whether CyberKnife is an appropriate technology. The doctor prescribes a radiation dose, number of treatments, and dose constraints; the objective is to treat the tumour cells, whilst sparing healthy tissue and organs at risk. The next step is treatment planning. Here the radiation therapist (in Australia; or medical physicist in other countries such as the US and UK) calculates how CyberKnife can deliver the dose. The practitioner inputs the desired dose into an inverse planning system, and the system calculates how to achieve this output. There may be several ways to optimise the computations and to achieve the desired dose. The planning system provides the dose distribution relative to the prescription. The doctor checks the dose distribution, organs at risk and the dose to the target. Then the medical physicists perform the quality assurance (QA) and check the dose to film; they confirm that the output radiation is correct. Medical physicists are responsible for ensuring the safety of the system, including QA on a weekly, monthly and annual basis. While the CyberKnife is being commissioned, they are performing more frequent QAs than usual. Finally the CyberKnife treatment is delivered to the patient. Radiation oncologists choose the treatment modality which is most suitable for the patient, since they know all of the details about the patient. Proton therapy is an option. I would suggest that you talk to your doctor and find out the reason for his/her choice and the advantages based on the case. Hope your husband gets well soon.